The terrorism of the British tabloids is well remembered from such events as the abdication of King Edward VIII (in favor of his marriage to American socialite, Wallis Simpson), or the divorce of Prince Charles and Lady Diana (and the tragic death of the Princess that followed). 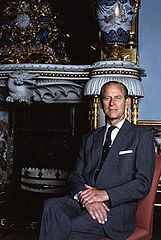 But few may recall the sensational 1948 scandal surrounding England’s Prince Philip, which followed his brief, and seemingly innocent night of association with popular British actress and singer, Pat Kirkwood. 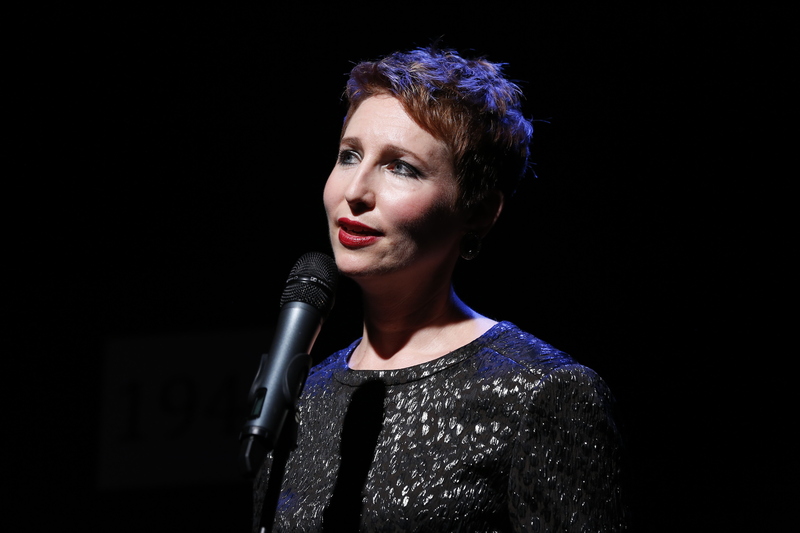 While there is much more to Jessica Walker’s lovely musical memoir of the star’s life and career, that brief episode is certainly at the core of Pat Kirkwood is Angry, now playing to packed houses at the 59E59 Theaters in Manhattan during the “Brits Off Broadway” series. As the audience learns, Kirkwood would become a star in varying degrees of both cinema and the musical stage. 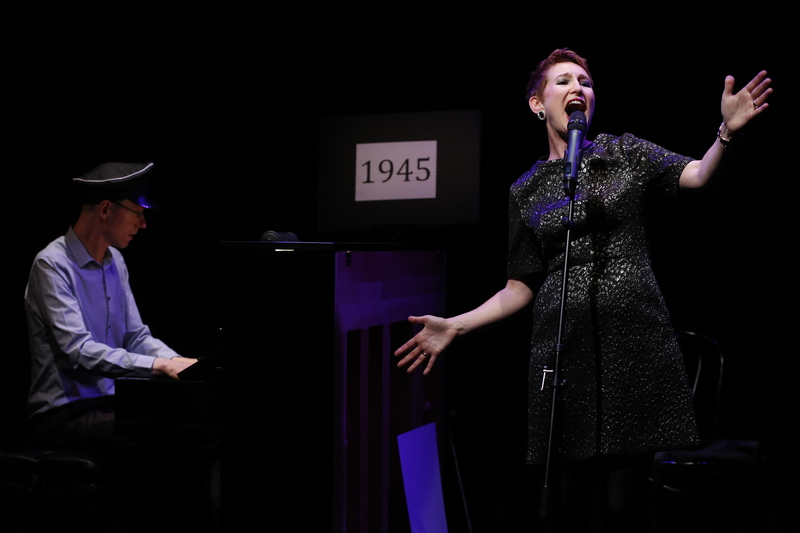 She was soaring in popularity in 1939, and has been referred to as “Britain’s first wartime star.” A one-woman show (with Miss Walker as both author and star), this enlightening musical journey begins with Kirkwood’s birth in 1921. Dressed in a simple black dress that shimmered a bit like the sparkling bracelet and earrings that accompanied it, Walker skillfully takes on the dual task of both narrating this interesting life story and, alternately, stepping into the role of Miss Kirkwood as songstress to perform an abundance of great musical numbers, some more familiar than others. Skillfully directed here by Lee Blakeley, with Musical Direction (and onstage piano accompaniment) by Joseph Atkins, Miss Walker certainly has the vocal talent for this role, and that was no surprise to those of us lucky enough to have seen her tour de force performance in last season’s, The Girl I Left Behind Me. As the story unfolds we learn of Kirkwood’s several marriages, some happier than others, her attendance at the sudden sad death of the father she hardly new, and the later tragic demise of her mother from Alzheimer’s disease after the many years they spent touring together. Those tours brought Kirkwood to not only such important London venues as The Palladium and The Hippodrome, but also “across the pond” to Hollywood. London successes included the show Top of the World (which carried on during the height of the German bombing), the Black Velvet revue (where she was a smash singing Cole Porter’s, “My Heart Belongs to Daddy,”), and West End productions of Lady Behave (1941), Let’s Face It (1942), and Goody Two Shoes (1944). There were British films as well, with appearances in Save a Little Sunshine, Me and My Pal, and the more successful English comedy, Band Waggon [sic]. By war’s end Hollywood called with a 7-year MGM film contract, and the star was soon rubbing elbows with the likes of Louis B. Mayer and Frank Sinatra. That chapter reminds one a bit of Judy Garland, with studio physicians guiding Kirkwood toward weight loss with drugs and diets in advance of her appearance in the ill-fated film, No Leave, No Love, with co-star Van Johnson. Despair upon box office failure of that film landed Kirkwood in a psychiatric hospital for eight months and ended the MGM contract. But more London stage successes awaited Kirkwood’s return in the late 1940’s, and it was then, backstage at The Hippodrome, that her friend, Baron, (royal court photographer), introduced Kirkwood to Prince Philip, the Duke of Edinburgh. The three dined together, danced a bit, and finished the long evening with breakfast at Baron’s apartment. Princess Elizabeth, the future queen, was eight months pregnant at the time, and the resulting tabloid furor regarding her husband, the Duke, though likely undeserved, would forever cast a shadow on “the prince and the showgirl.” An angry Miss Kirkwood would never really have the satisfaction of clearing her name of such an alleged one night stand. While the last years of the star’s life find her drifting away into Alzheimer’s like her mother before her, Walker’s touching closing number of, “For All We Know,” seems a fitting and reflective look back on this life we have just come to know. But for this critic, one song performed stood out above all the rest. Walker’s haunting rendition of Cole Porter’s, “Begin the Beguine,” was overflowing with magic and mystery that would have the appreciative audience applauding longer and louder than ever. PAT KIRKWOOD IS ANGRY continues through Sunday, June 29th, at 59E59 Theaters, 59 East 59th Street, New York, N.Y. Performances are Tuesdays-Thursdays & Sundays at 7:30 pm, Fridays & Saturdays at 8:30 pm, with matinees at 2:30 pm on Saturdays and 3:30 pm on Sundays. Tickets are $25 ($17.50 for 59E59 Members). For tickets and information call Ticket Central at (212) 279-4200 or visit the website at http://www.59e59.org. This entry was posted in 59E59 Theaters, BroadwayStars.com, Cole Porter, Concert Reviews, London Theatre, Nightclubs, Noel Coward, Off Broadway, Pat Kirkwood, Pat Kirkwood is Angry, Prince Philip the Duke of Edinburgh, Theater Reviews, ThePeoplesCritic.com, Van Johnson and tagged 59E59 Theaters, Cole Porter, concerts, musicals, nightclubs, Off Broadway, Pat Kirkwood, Pat Kirkwood is Angry, Prince Philip the Duke of Edinburgh, theatre, Van Johnson. Bookmark the permalink.